Fritsch was born in Wales. From 1958-1964 she studied the harp and piano in Birmingham and then at the Royal Academy of Music in London. In 1968 she joined the ceramics course at the Royal College of Art and gained her MA in 1971. 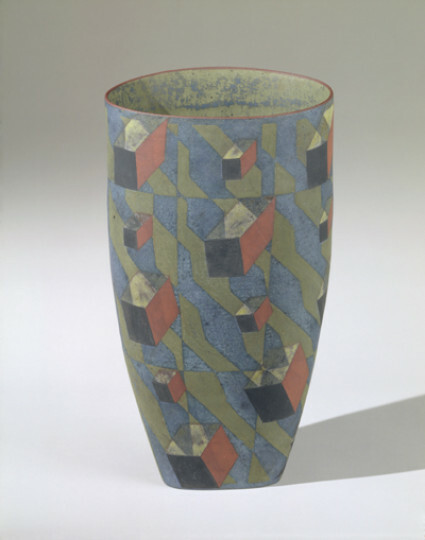 In 2000- 2003 she showed, unpatterned, more three dimensional and larger pieces in stoneware such as Drifter (2000) but has since returned to the earlier flatter geometric or ‘optical’ style, refining her technique and mode of decoration over the years. Her pots have a quiet authority and a disquieting almost trompe l’oeil presence. Her ceramics have been described by Edward Lucie-Smith as ‘metaphysical pots in painted stoneware’. Her work is in many public collections across the world, including the Museum of Modern Ceramic Art, Gifu, Japan, Kunst Industrie Museet, Copenhagen, Museum of Decorative Art, Montreal and the Victoria & Albert Museum, London. In 1995 Elizabeth Fritsch was made a Commander of the British Empire and a Senior Fellow at the Royal College of Art. Clay based products produced from non-metallic material and fired at high temperature. The term covers all objects made of fired clay, including earthenware, porcelain, stoneware and terra cotta. One of the three major types of pottery, the others being earthenware and porcelain. A buff, gray or brown clay is mixed with other clays and ceramic materials to make a heavy, opaque, highly plastic clay body that is fired at a high temperature - above 1200ºC. It is in between earthenware and porcelain in its character. The term stoneware also refers to the clay body and objects made from it.